The next trip took about 2.5 hours of driving through windy mountainous roads to land us in the beautiful city of Sevilla (sometimes spelled "Seville" by the British). Sevilla is known for its popular bullfighting ring, it's huge cathedral built on the site of a former mosque during the Reconquering, and a Moorish palace called "Alcazar". 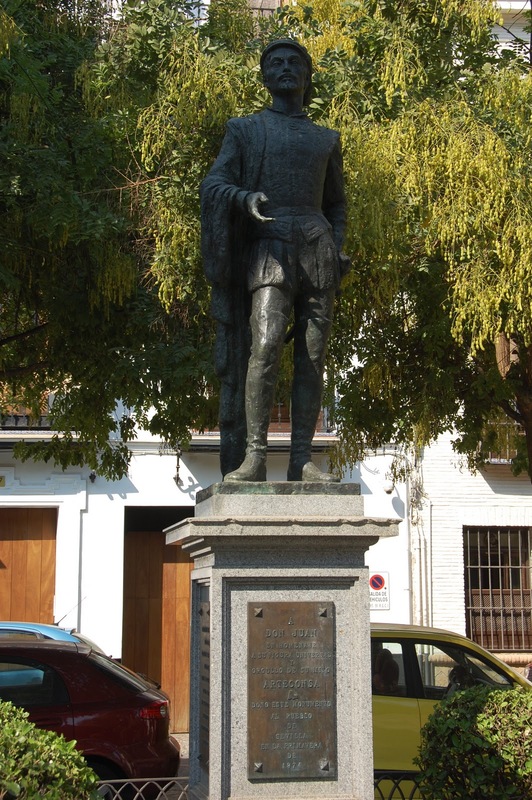 As it turns out, it's also the home of the original "Don Juan", who's commemorated in a statue shown below. 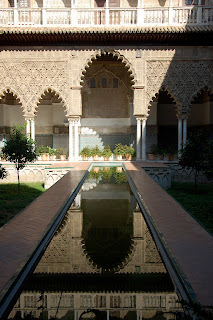 We had a beautiful day walking around and taking in the delightful blend of Moorish and Spanish architecture. 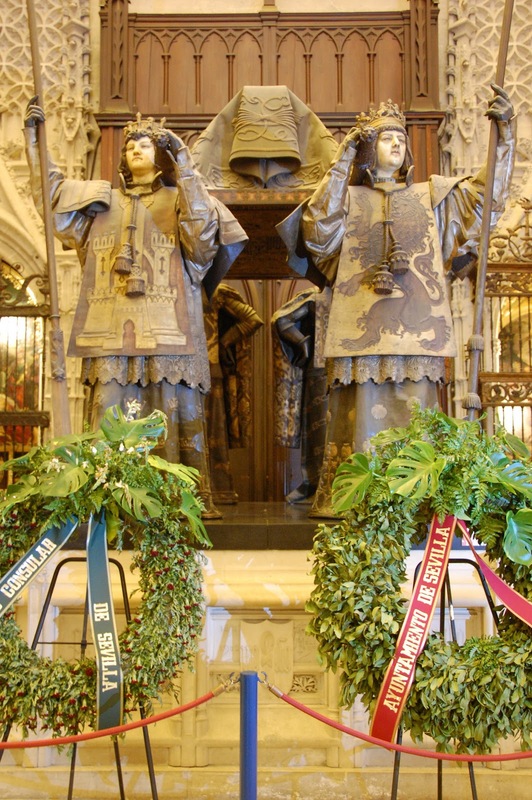 Columbus' Tomb - he was tied to much of this region of Spain and his body was moved from the Caribbean and supposedly rests now under the guard of these gentlemen. Columbus' Tomb - recall that he was from Genoa, Italy, but since it was King Ferdinand and Queen Isabel that spotted him a few pesos to sail to the "New World"
Crown from the cathedral treasury - I think it was a crown worn by Isabel, but I could be wrong. Either way it was loaded with some 10,000 precious stones and featuring this angel with a body made out of the largest pearl in the world. View from the top of the tower in the cathedral - notice the famous bullfighting ring on the right. 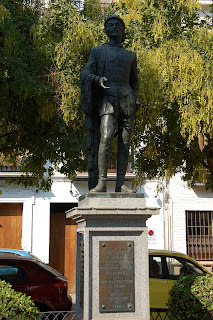 Here he is ladies........the original Don Juan from Sevilla. I don't know about you, but I thought he'd be a little taller. ......and plenty of natural beauty such as these immaculate gardens. Marisa enjoyed the return trip to Sevilla and it was nice spending a beautiful day there.